I would like to take this opportunity to thank all of you for making our first show a huge success. To answer one of your questions: Yes, scheduling it for Easter weekend was an accident. We assumed Easter would fall earlier in April like it usually does, but we were fully into the planning and fully committed by the time we realized the conflict. Attendance was still great, with a little over 2,800 for the two-day event, and a couple of the vendors completely sold out of product. Our instructors did an awesome job but were a little too popular. We had seating for 200 in front of a big screen and 350 packed in there for the first lecture. I apologized to the crowd and we were able to reconfigure the room to 380 seats before the second lecture. We received many compliments about the quality of our volunteers and staff. 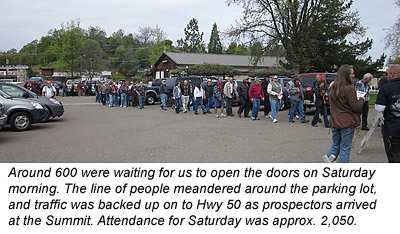 We couldn’t have pulled off this event without the tremendous help we received from the Mother Lode Goldhounds, Gold Country Treasure Seekers, El Dorado County Fairgrounds staff, Brian Bartholomew and Brian Kuhl at the Monday training site, and our extended family who spent some long hours at the venue. It rained on us during the training day (Monday) until about noon, but the attendees were excited and didn’t let it bother them one bit. I think every single person found a little gold. I want to personally apologize to those of you who wanted to attend this training and were disappointed that it was booked up. We had no idea there would be such a huge response. We’re exploring the possibility of more hands-on training days next year and we’ll see what we can work out. Overall, I couldn’t be happier with the results. Our June 2011 issue will include complete coverage of the event. In the meantime, I would love to get some feedback. Let us know your likes and dislikes. What did we do right? What could we improve? If you're logged into your subscription account, you can post your comments below. Or, if you are not logged in, you may send your comments by email to: showcomments@icmj.com Please include your home city and state so we can include that in our comments. 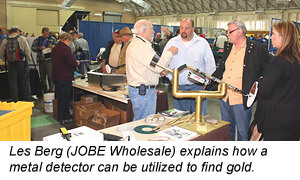 I just wanted to say what a great time I had at the gold show in Placerville. It was the first show of it's kind I have attended and it didn't disappoint. I got to go to the hands on training day, and spent most of my time working a homemade high banker courtesy of the Gold Hounds. It was a great experience for me. I'm enclosing a picture of the gold I brought home, with special thanks to the Easter Bunny! After the trip Monday to the mining site my truck was covered in mud. Tuesday I gave it a hose down and attempted to wash some of the mud into the gutter but didn't have time to really accomplish that. So I had dried dirt in my driveway. Having been bitten by the gold bug, what do you think I did??? You got it, swept up the dirt into a dust pan and panned it out in the backyard. I was first amazed at how much black sand there was, the second thing I was amazed at were the half dozen small flecks of gold and one decent sized flake I found in my pan! Moral of the story? Don't dont hose your gold bearing dirt into the gutter!! 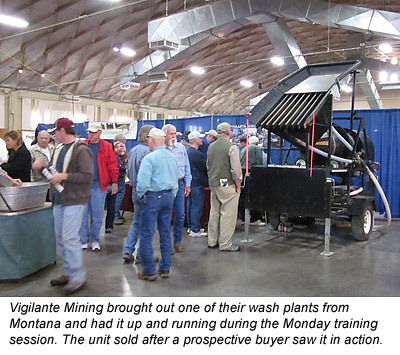 My name is Dan & I was at the ICMJ Prospecting & Mining Summit 4/23/11. I got to hear part of your presentation about searching for gold. I did not have a pen with me & wanted to get the name of the books you had mentioned, especially the yellow book which you said is hard to find. Attached is the complete list. Hope this helps! 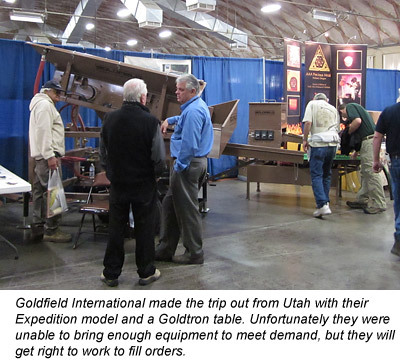 How to Locate a Promising Location for Gold Prospecting: References cited. I’m just home from your April 25th Hands On, In Field Training Day, and I’m both exhausted and exhilarated. I’ve been prospecting for about five years with a small sluice box and pans, and this was a fantastic opportunity for me to explore and use some of the other methods of finding and extracting gold. 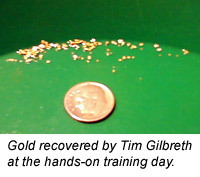 All of the instructors were helpful and very patient in explaining how the different equipment worked, and in providing tips on how to get the best gold recovery possible. Using just a sluice box and pans previously, I was impressed on how other equipment made the job easier and much more efficient. Now I’m saving for a high bank system. At the end of the day I walked away with much more gold than I ever had found in my five years of sluicing and panning. Thanks for putting this day together. It was very well organized and well run. I hope you have another Training Day next year. I’ll be the first to sign up. 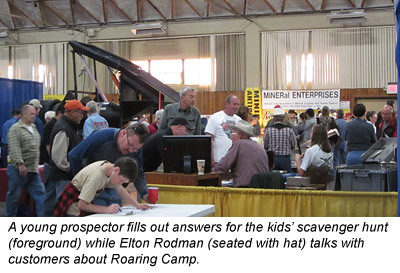 The Gold Prospecting and Mining Summit held the previous two days in Placerville was well done as well. It was great being able talk to so many manufacturers about the different equipment and processes they represented, and their show prices were good. I attended three lecture seminars at the Mining Summit one day and found all to be top notch. I learned quite a bit. Thanks again for the fantastic opportunity. I’m hoping you have it again next year. My only suggestion would be to have it a month or so later so that the rainy season might be over. I came home a tired happy mess. I just wanted to take a moment to thank you for putting on the show and the training event yesterday. I specifically want thank the person who came up with the idea of the scavenger hunt for the kids. Without that hunt my kids would have been begging to go home the entire time we were there. Instead, they were feverishly hunting for answers. The training day was a good event. Plenty of mud to go around. :) I enjoyed spending time on a power sluice but was hoping to get more education on pay layers and what to look for. Maybe if a similar event is organized an in-field seminar could be included. Your First Mining Summit was Great!!! Great job to you all!! !